On Sunday, March 17th, 2013, Pope Francis delivered the first Angelus address of his pontificate. Given that he spoke before and after a Marian prayer, the Angelus, one should not be surprised that Our Lady was invoked in some way. He shared three pertinent things regarding Mary. 1. Pope Francis relayed the story of an event on the occasion of welcoming Our Lady of Fatima into Argentina (I presume this is a pilgrim statue that arrived for the first time in the country). Pope Francis recounted “Our Lady of Fatima had just arrived in Buenos Aires and there was a big Mass for the sick. I went to hear confessions at that Mass. And near the end of the Mass I got up, because I had to administer holy oil. …” Pope Francis by no means intended to covey a theological point about Our Lady of Fatima. What is important in this situation is to notice what happened when Our Lady of Fatima arrived in Buenos Aires, and that there was a Mass for the sick. Additionally, the Archbishop went to hear confessions. 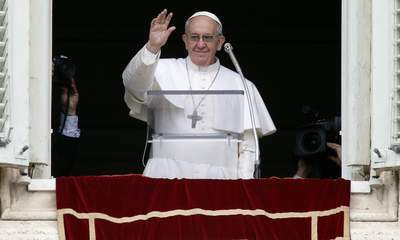 As he set up the scene to convey a story about mercy, Pope Francis found it necessary to reference the specific occasion, a celebration in honor of Our Lady of Fatima. The Church has a great devotion to Mary; on certain occasions festivals are held in her honor. But the focus was not on Our Lady, it was on the sacraments–Holy Eucharist, Confession, and Anointing. Our Lady brought together large numbers in order to present them to her Son. Our Lady’s apparition in Fatima in 1917 was the catalyst of conversions throughout the world and a return to the sacramental life of the Church. While it was just a simple, scant reference to Fatima, there is much more that can be drawn from it as the Holy Father addressed the theme of mercy. As seen by his story, Mary brought people together to experience the mercy of God in the sacraments. 2. Before praying the Angelus, Pope Francis stated: “We invoke the intercession of Our Lady who held in her arms the Mercy of God made man.” People can relate to this image of Mary. Mothers can relate to Mary who held Jesus in her arms. This image is evocative of many scenes in Christ’s life, of course it evokes Mary holding the Christ child, but in this season of Lent, it also evokes the image of Mary holding the lifeless body of her Son in her arms. Jesus, giving his life for the salvation of the world, was the supreme act of mercy par excellence. By saying yes to the angel, Mary cooperated in God’s plan for the redemption of the world through the mercy of the Father, Son, and Spirit. Lastly, Pope Francis spoke of the incarnation, God made man, which looks to Mary as the Mother of God, a title that we so often pray in the Hail Mary. In the Hail, Holy Queen we even call Mary the “Mother of Mercy,” that is, Mother of the one who is Mercy Himself. There are two important things to note from this reference. The first is the fact Pope Francis invoked the protectress role of Mary. He prayed for Mary’s protection over Pope Benedict XVI and over Rome, and made a special pilgrimage to Shrine of Our Lady Protectress of Rome at the Basilica of Santa Maria Maggiore. This theme, I believe, will remain consistent over his papacy as seen by other writings as Archbishop of Buenos Aires. Secondly, He spoke of Jesus calling us to be part of a new family, his Church, which is the family of God. At first glance it may not seem to be overtly Marian, but it is! The constitutive elements of a family are a father, mother, and children. If we view the Church as a family, then God is our Father, and the Church is mother. What can be said of the Church can be said of Mary, so Mary also is our mother. She is the mother of God’s children. She is, in fact, Mother of the Church. In this Christian family then, it is necessary for there to be a mother, and that mother is both Mary and the Church. Originally published at Mary and the Pope, used with permission.